Focused ultrasound surgery has now been performed successfully on nine human patients, according to a preliminary study done in Switzerland. This appears to be the same technique used in this bloodless ultrasound surgery technique pioneered in 2007. "The groundbreaking finding here is that you can make lesions deep in the brain--through the intact skull and skin--with extreme precision and accuracy and safety," says Neal Kassell, a neurosurgeon at the University of Virginia. Kassell, who was not directly involved in the study, is chairman of the Focused Ultrasound Surgery Foundation, a nonprofit based in Charlottesville, VA, that was founded to develop new applications for focused ultrasound. The Swiss study tested the technique on nine patients with chronic debilitating pain. The traditional treatment involves destroying a small part of the thalamus, a structure that relays messages between different brain areas. This can be accomplished with radiofrequency ablation, in which a probe is inserted into the skull, or with radiosurgery which focuses radiation on the area. Surgeons believe that the new technique will be faster-acting an more precise than the current methods. The ultrasound beams are focused on a specific point in the brain--the exact location depends on the condition being treated--that absorbs the energy and converts it to heat. This raises the temperature to about 130 degrees Fahrenheit andkills the cells in a region approximately 10 cubic millimeters in volume. 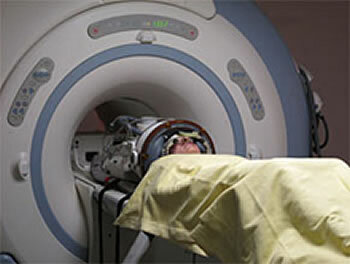 The entire system is integrated with a magnetic resonance scanner, which allows neurosurgeons to make sure they target the correct piece of brain tissue. "Thermal images acquired in real time during the treatment allow the surgeon to see where and to what extent the rise in temperature is achieved," says Zadicario. 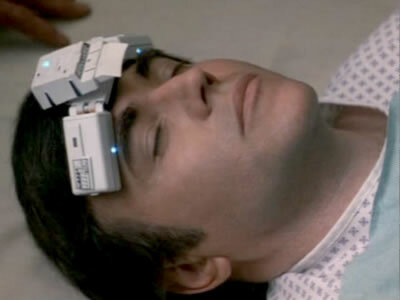 Fans of the late-twentieth century photodrama Star Trek IV: The Voyage Home fondly remember that Dr. McCoy has a device that allows him to avoid cutting patients open and yet still perform surgery; he angrily locks 20th century physicians in a closet rather than let them touch Chekov. "My god, man! Drilling holes in his head's not the answer! ...now put away your butcher knives and let me save this patient before it's too late!" Via MIT's Technology Review (they also have a short animated video of the procedure); thanks to MrX_TLO, with apologies for the long lag time in preparing this article.